In almost any weather condition, motorcycles can be found perfectly lined up out front of the Smiling Skull Saloon, 108 W. Union St., waiting for their owners to take them out on their next ride. Referred to as “The Skull” by many, the dive bar has small-town charm that attracts many loyal customers, a majority of them being Athens residents and bikers. It has become a second home for a niche of people that enjoy the saloon’s atmosphere and share a common love for the freedom and thrill of motorcycles. When the founder of the Smiling Skull Saloon died in December 2017, his son Locke Wolf and daughter Adrienne Whitney took over the business. Much of what Wolf knows and loves about bikes came from growing up around his father. Nick Whitney sits on his Harley-Davidson, which was passed down to him from the former owner of the Smiling Skull Saloon, Chris Wolf, on Sunday, March 24, 2019. As a child, Wolf learned how to ride dirt bikes. Wolf’s family has always started out on dirt bikes until they were ready to transition to motorcycles. It wasn’t until Wolf was 15 years old when his father introduced him to motorcycles. The transition from dirt bikes to Harley Davidsons was tricky for Wolf, but his father helped him through it all. Today, Wolf has two motorcycles. One is his father’s 1979 Shovelhead, and the other is a blue Softail standard 6-speed, a motorcycle that has six forward gear ratios inside the transmission. The Softail is Wolf’s first and only Harley that he bought seven years ago. The biker blood that runs through Wolf’s veins is one many other regulars of The Skull possess. 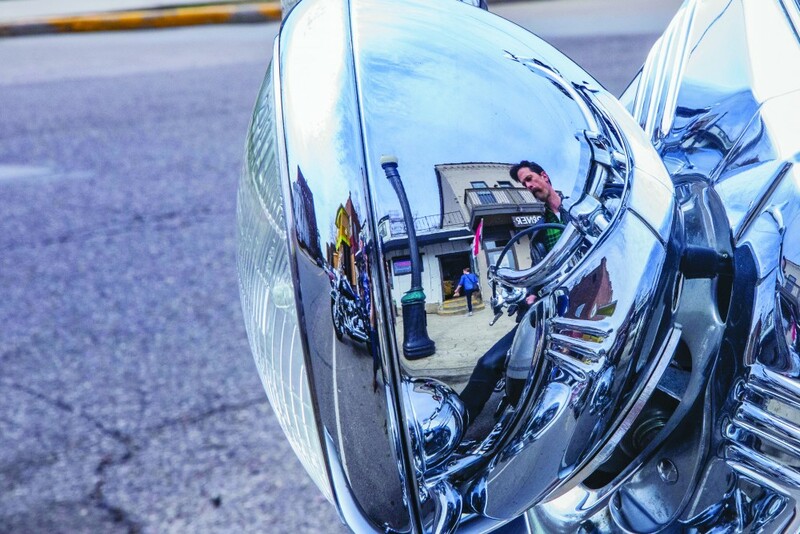 From the sweet hum of the motor to the scenic rides through Southeast Ohio’s curvy roads, the feeling of freedom motorcycles give riders is what keeps them on the roads for miles and miles with no particular destination in sight. Like Wolf, Robert Estes started out on dirt bikes and eventually got into Harleys. Estes, a carpenter in Athens, has traveled all over the U.S. racing dirt bikes. When he’s not racing, he gets on one of his Harleys and rides every day the sun is out and shining. Estes has traveled to Milwaukee, Wisconsin, and Sturgis, North Dakota, on his bike, but the coolest motorcycle ride he has ever been on is the massive motorcycle rally called Rolling Thunder held in Washington, D.C.
No matter where Estes travels, as long as it’s on his bike, it’s a good day. “You can have the worst day of your life, but when you get on that bike and go down the road, you don’t have to worry about anything for a minute,” Estes said. Despite the draw of big biker rallies, Nick Whitney believes the best roads a biker can travel on are right here in Southeast Ohio. 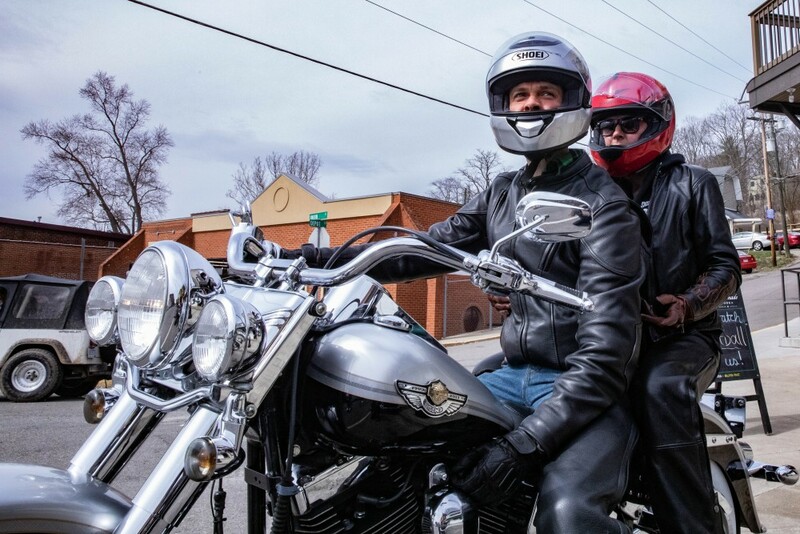 Whitney, husband to Locke’s sister, has ridden his BMW touring motorcycle through states like West Virginia and North Carolina, but he mainly sticks to riding the variety of routes offered in the area. 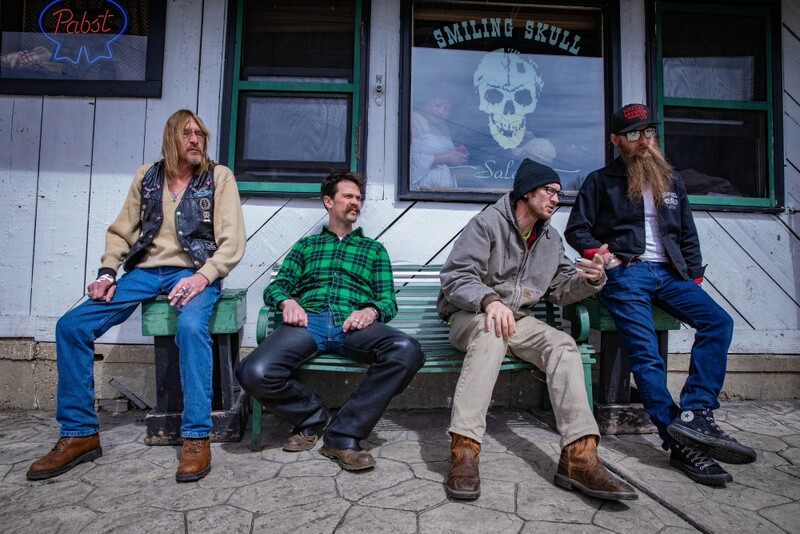 (Left to right) Bob Rankin, Nick Whitney, Travis Fruge and Locke Wolf sit together outside Smiling Skull Saloon on Sunday, March 24, 2019. The routes Whitney talks of are a part of Ohio’s Windy 9, which are nine motorcycle routes of nearly 1,000 miles that give riders a scenic view of Southeast Ohio through the Appalachian hills. The curvy roads and sharp turns are elements of the routes Whitney believes to be worth the ride. The curvy roads that give motorcyclists that rush of adrenaline is what keeps them out on their bikes, so staying safe on the roads is an important element to being a biker. Almost 5,000 people were killed on motorcycles in 2017, almost 300 less than 2016, according to a report done by Governors Highway Safety Association. Despite the 5.6 percent decrease in motorcycle fatalities in 2017, the report finds that motorcyclists remain significantly overrepresented as a proportion of all traffic deaths. With the fatality statistics for motorcycle riders being so high, it’s important that Whitney stays safe when out on the roads with other bikers and vehicles alike. There are motorcycle foundation safety courses Whitney believes all people, especially the ones just getting into motorcycles, should look into taking. Another element of motorcycle safety is wearing the proper biking attire when out on the roads. Earl Clark has been riding motorcycles since he was 11 years old, and over time he has discovered the proper clothing one should wear out on a ride. “If you’re going on a longer ride and you’re going out to stay out, you should always have a heavy coat and sometimes your chaps,” Clark said. Clark rides mainly in the summer, so his choice of clothing is constantly changing depending on how he’s feeling and how nice the weather is. The summer is a perfect chance for Clark to take his hot rod out to meet up with friends for a beer, cruise around town or just hear the soothing sounds of his Harley on a delightful day. To many, the ideal biker look might include someone decked out in head-to-toe black leather, patches and sometimes some bling. To Wolf, all that stuff might be nice, but he prefers to be comfortable when he rides. People have made stereotypes that aren’t always true about bikers from essential clothing items like leather, Wolf said. For many bikers, their love for motorcycles was passed down by the generation before them. All of the mentoring, education and riding on the backs of their fathers’ Harleys was the start of a passion that only grew with time. The love for dirt bikes and motorcycles that Wolf’s father taught him is a practice he’s begun to introduce to his 9-year-old and 5-year-old boys. Wolf’s goal is to help his child ease back into it and hopefully learn from the crash. Despite that incident, Wolf’s oldest boy loves riding the dirt bike, but it’s something his second child is still slightly intimidated by. Wolf teaches his sons the responsibility with buying bikes and riding them. It’s a privilege to be able to ride. It’s not just something one gets, Wolf said. The shared interests and ideas among bikers as a group are what shape them into the defining subculture they are. Throughout history, bikers have carried a somewhat deviant reputation, but Larry Burmeister, a sociology professor, thinks that reputation has transformed over the years. 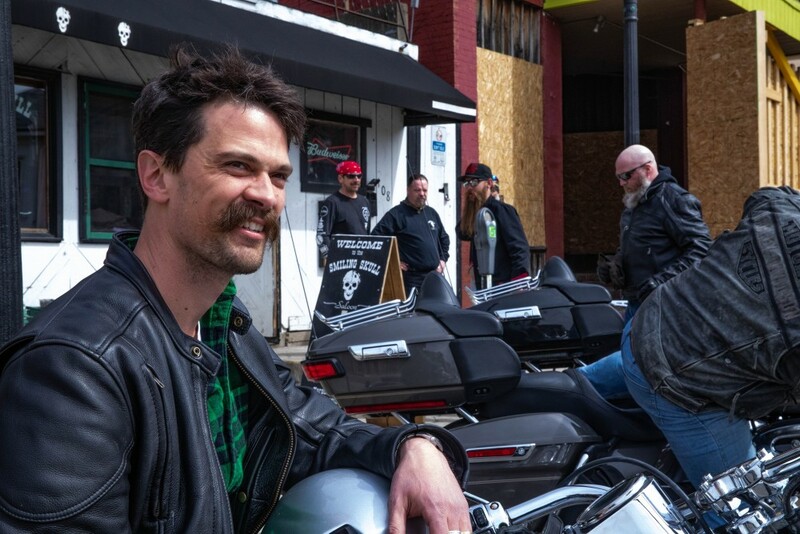 Nick Whitney sits on his Harley-Davidson outside Smiling Skull Saloon with his fellow bikers on Sunday, March 24, 2019. Burmeister believes bikers vary quite a bit depending on their history and reasons they establish their groups. When Burmeister went to school in California, some of the biker groups there had a disreputable character among the general populace. But from what Burmeister knows of the bikers around Southeast Ohio, that doesn’t seem to be the case. The camaraderie bikers share is a distinctive quality the people who identify as bikers take pride in. To Whitney, the cohesion of the subculture is something that has really surprised him, but it’s something he has come to cherish throughout the years.